The Federal Reserve won't wait too long to raise rates. 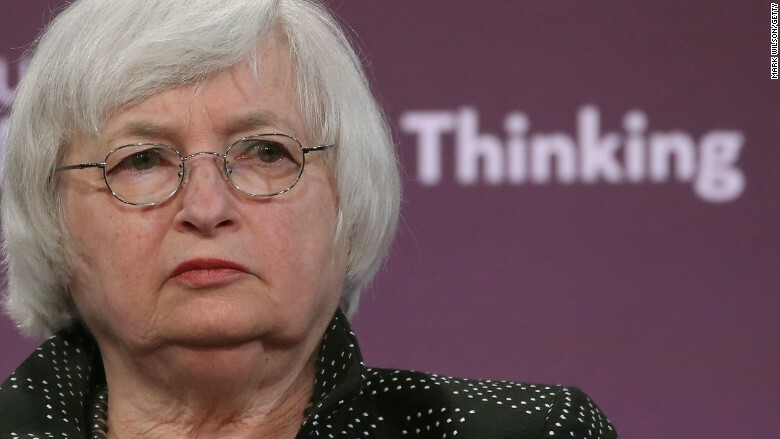 Delayed action would risk "overheating the economy," Fed Chair Janet Yellen said Friday. Speaking in Providence, Rhode Island, Yellen said the Fed will likely raise its key interest rate this year for the first time in almost a decade. It was a sign of confidence from the Fed chair, whom many economists consider to be very cautious. "If the economy continues to improve as I expect, I think it will be appropriate at some point this year to take the initial step to raise the federal funds rate target," Yellen said. Translation: the Fed could raise rates in September. However, the Fed chair expressed concern over the economy's recent slowdown. The pace of job gains has weakened in 2015, and economic growth has been flat. Wages aren't picking up much either. As Yellen admitted in the speech Friday, "in my judgment we are not there yet" on the economic recovery. Sunnier economic times ahead? Although Yellen believes the Fed will raise rates this year, it still appears highly unlikely that will happen in June. Earlier this year, there was speculation that the Fed could raise rates in June, but the economic slowdown pushed back many economists' expectation for a rate hike liftoff. Now most experts believe a September rate hike is most likely. But what matters more than the timing of the first hike is what the Fed does next. Will it follow action in September with more rate hikes in subsequent months? And if so, how many percentage points will the Fed go for? The Fed put rates at zero in December 2008 to help boost the economy. A rate hike would signal that the Fed believes the economy is healthy again. Yellen pointed out the progress the economy has made during the 6-year recovery. The unemployment rate is down to 5.4% from its peak of 10% in 2010. America is still gaining jobs, not losing them, albeit at a slower pace now than last year. The economy's upcoming summer will play a critical role in the Fed's decision to hold or raise rates. Although Yellen expects the economy to gain steam later this year, she expressed disappointment about its progress so far in 2015. "A number of economic headwinds have slowed the recovery, and to some extent, they continue to influence the outlook," Yellen said.